A private spaceship is scheduled to launch on its first official cargo run to the International Space Station next week. 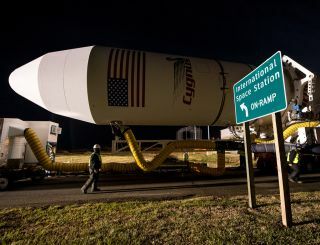 The unmanned Cygnus spacecraft, which is built by Virginia-based firm Orbital Sciences, is slated to blast off from NASA's Wallops Flight Facility in Virginia on Tuesday afternoon (Jan. 7), in a launch that could be visible from large stretches of the U.S. East Coast, weather permitting. If all goes according to plan, Cygnus will arrive at the station on Friday morning (Jan. 10), delivering 2,780 pounds (1,261 kilograms) of supplies and science experiments to the crewmembers of the orbiting lab's Expedition 38, NASA officials said. A Cygnus spacecraft has visited the space station once before during a landmark demonstration flight last September. But Tuesday's launch will initiate the first of eight robotic supply runs that Orbital Sciences plans to make using Cygnus and its Antares rocket, under a $1.9 billion contract the company signed with NASA. Tuesday's five-minute launch window opens at 1:55 p.m. EST (1855 GMT), Orbital Sciences officials said. According to viewing maps released by the company, the liftoff may be visible from as far south as South Carolina and as far north as Boston. When the Cygnus arrives at the station next Friday, NASA astronaut Michael Hopkins and Japanese spaceflyer Koichi Wakata will snag it using the orbiting lab's huge robotic arm. The Cygnus will stay berthed to the space station for 42 days, Orbital Sciences officials said, at which point it will be filled with trash and depart, eventually burning up in Earth's atmosphere. The mission was originally supposed to blast off last month, but it was delayed after a cooling pump module malfunctioned on Dec. 11. NASA decided to replace the pump module over the course of two holiday spacewalks, pushing the Cygnus launch into January. Orbital Sciences isn't the only firm with a NASA cargo deal. SpaceX holds a $1.6 billion contract to fly 12 robotic supply missions using its Dragon capsule and Falcon 9 rocket. The California-based company has already completed two of these missions, and the third is slated to blast off next month.